Between my flight from Miami (AA2619) and the connecting flight to Frankfurt there only was a time slot of 45 minutes. Due to the fact that you could book this flight combination at American Airlines, I felt confident that we should get our plane in this short time. On the other hand I was a bit nervous, especially when I thought about a "gate-change". As I stepped out of the plane that took me to Charlotte I already saw a sign that told me: AA704 - Frankfurt, Germany. The only worry I had when I took a look out off the window was, that the ground crew already began loading the luggage into the airplane. 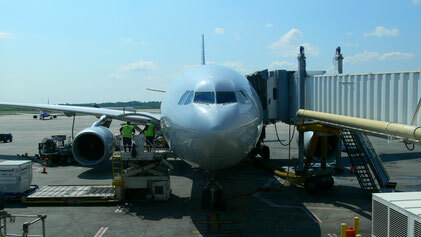 The aircraft which should bring me back to Germany was an Airbus A330-200 with the registration N285AY. She was delivered to US-Airways on March 24th 2010 and joined American Airlines with the merge in December 2013. We only had to wait about 15 minutes at the gate before we were allowed to board the aircraft. On this flight I also got a pretty nice window seat on the left hand side behind the trailing edge of the wing. After pilot and purser welcomed the passengers onboard, our journey to Frankfurt began. The pilots taxied N285AY to runway 18C, the runway we should takeoff from. We had to wait a few minutes before we could takeoff due to some traffic. About ten minutes behind our scheduled departure we left Charlotte. After takeoff we flew a left hand turn. I had a wonderful view over Charlotte and the airport. Even before we reached our cruising altitude, the passengers received their first beverage. Shortly after reaching our cruising level, the flight attendants gave us our dinner. As on the flight to Philadelphia we could choose between chicken and pasta and as on the flight to the US, it tasted very good. Our stewardess was so friendly, my friend an I talked to her the entire flight. After she gave us our beverages and meals, she asked my friend and me very kindly if we wanted to have a beer. Of course we said yes and a few minutes later she came back and brought us a Budweiser and another beer and said: "Please try it, that's new onboard and tell me how it tastes." With two beer for free, the dinner tasted a lot better than it did already. The "new beer" tasted like dish liquid. Not only we thought this but also another passenger we gave the can too. As the stewardess came along to ask us how the beer tasted she laughed when we told her about the taste, threw the "new" beer into the bin and gave us another Budweiser. One Budweiser costs 7.00$ onboard of an American flight, we got two for nothing. Over the northern part of the atlantic ocean the sun set slowly and onboard the cabin was turned into night mode. The cabin lightning was turned off and curtains were placed around the doors to protect the cabin from lightning as soon as the sun would rise again. While most of the passengers slept, I was able to watch a movie for the first time of my trip: Assassin's Creed. Later on I listened to some music and then I slept for about two hours. As soon as I woke up, I was so thirsty that I walked to the rear galley where two flight attendants sat and talked. On a tablet there were some cups filled with beverages. When I asked the stewardess if I could take take something from the tablet, she laughed and said ironically: "First you gonna kiss my feet." Behind Iceland we slowly headed towards europe. 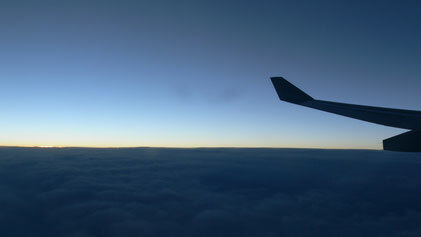 The sun rose on the left hand side of the aircraft and soon the first passengers woke up from their sleep. Then the cabin lightning was turned on slowly. With the first service on this early day, most of passengers wanted to have a coffee while I enjoyed a black tea. With the second service our cabin crew gave us another beverage and a breakfast. For me a positive surprise was that the breakfast was cold served. Inside the box there was a little bun with butter as well as a blueberry muffin and some cereals with yogurt. Also the breakfast tasted very good. While descenting towards Frankfurt the captain gave us the latest weather information for Hesse, freezing seven degrees Celsius (45 Fahrenheit). We approached Frankfurt and landed with light winds from the east on runway 07L. This last landing was the very best of the entire trip and after breaking down on the 2.8 kilometer long runway we turned of to a taxiway. We landed about 25 minutes ahead of our scheduled arrival time but we had to taxi for about 20 minutes to our gate. It was a good but at the same time a sad feeling to be back in Germany. After we arrived at Gate D4 and the engines were turned off, the common fight started of who would exit the aircraft first. I was on of the last persons to left the plane. The stewardess which gave my friend and me the beer stood at the door and as we went off the aircraft she asked us: "I'm sorry guys, but can I hug you ?" Then also the stewardess next to her wanted a hug before we left the airplane. Our luggage arrived in Frankfurt with no delay and with no damage. About 30 minutes after reaching the parking position, we left the security zone.